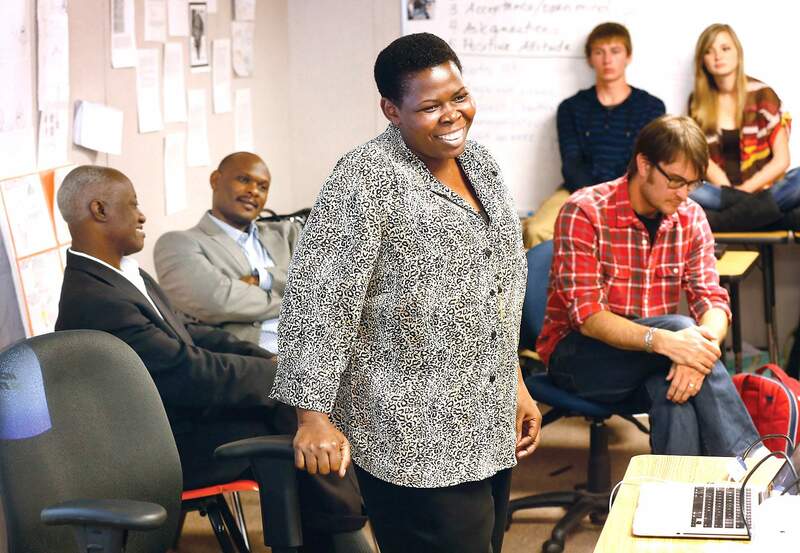 A senior member of the Ugandan Parliament told Durango high school students Friday that her country welcomes foreign groups that help improve life in Africa, but she cautioned them not to adopt “fix-it-all” attitudes and instead come prepared to listen. Namayanja spent last week traveling throughout Colorado at the invitation of the Global Livingston Intitute, a Denver-based nonprofit. In Durango, she spoke to about 80 students at Animas High School, some of whom were studying the history of imperialism in Africa in their humanities class taught by Sara Finnegan-Doyon. Namayanja and her husband, Charles Nsereko, also toured Mercy Regional Medical Center. Joining the delegation was Dr. Mubiru Wilson, a health officer for the Mubende District Local Government. Namayanja’s advice lines up with GLI’s goal to take people to Africa to see it, not change it, said Director John Pirkopf. “We want to leave with a better understanding of appropriate solutions,” he said. Uganda’s economy has steadily improved during the last four years after decades of civil war and oppressive regimes, Namayanja said, which means the country can better absorb the work being done by foreign groups. “Stability is a prerequisite for development,” she said. During the wars, few foreign investors took a chance in Uganda, leaving the country to rely on its broken economy. Post-war, Uganda first had to find ways to get girls enrolled in schools. Once they did, the government was challenged to provide quality education because the teacher-to-student ratio was 1 to 150. Today, Namayanja said, it has decreased to about 1 to 60. At only 38 years old, Namayanja is an important female voice in Uganda’s government. A lawyer by trade and a member of the country’s ruling party, she has served as a Parliamentary member for 13 years. She is a vocal advocate for women and equally vocal in Parliament, where women make up 39 percent of the members. More than 40 percent of the country’s Cabinet is women. The increased female representation is important because constituents yearn for change. “With the change, you are no longer because elected just because you are a woman but because you have something to say,” she told students. Rose Namayanja, Minister of Information and National Guidance for the government of Uganda, spoke to Animas High School students Friday. Namayanja is a senior member of Uganda’s Parliament. Behind her, from left, are Dr. Wilson Mubiru, district health officer for Mubende District medical department, Charles Nsereko, Namayanja’s husband, and John Pirkopf, director at Global Livingston Institute. Rose Namayanja’s perspective about how the U.S. and Uganda can continue to collaborate on development projects that improve Africans’ lives is helping GLI garner interest in its work. Each year the institute organizes and leads student trips and community leader trips to Uganda and Rwanda. There, the groups “listen, think and then act” to garner ideas that are mutually beneficial. Director John Pirkopf said the institute works to “turn the message of charity work on its head.” Key to that is more listening and understanding a community’s needs. “We take people there to see it, not change it,” he said. The institute works on issues of poverty, child violence, environmental conservation, health and more. GLI partners with several organizations, including the University of Colorado Denver School of Public Affairs, the Buechner Institute and Makerere University. For more information, including opportunities to be part of a student or community leader trip, visit www.globallivingston.org.